Slag-Cement, Cement-Bentonite (SCCB) Slurry Wall. 2250 Linear Feet. 54,695 Square Feet. Maximum of 30 feet deep. Target Permeability of < 1 x 10-6 cm/s at 56-Day. Target UCS of > 25 psi at 28-Day. 17 turns ranging from 45 to 90 degrees. Narrow work platform causing machinery to be operated within close proximity to adjacent buildings. The Bloomsburg Flood Protection Project site neighbors the Autoneum Manufacturing Plant and the local Bloomsburg Fairgrounds. Autoneum is one of the largest employers in Columbia County and recently has fallen victim, along with the rest of the Town of Bloomsburg, to catastrophic flooding. To divert the floodwaters around the plant, a floodwall was designed by Borton Lawson Engineering. The floodwall consists of an H-Pile wall (installed into the SCCB wall), an MSE wall and earthen embankments. 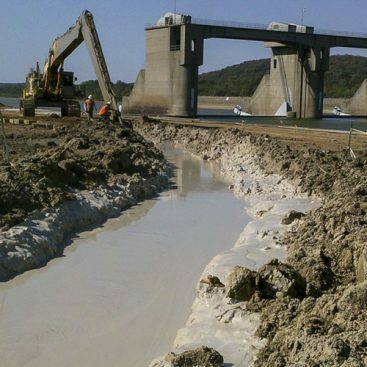 Geo-Solutions provided technical assistance to Borton Lawson Engineering during the design phase of the floodwall. Geo-Solutions worked as a subcontractor for the $30 Million project. The scope of the project was to install the cement-bentonite slurry wall along the centerline alignment for the planned H-Pile wall. The slurry wall was designed to cutoff soil strata consisting of high permeability cobble and sand that allowed for the flow of high volumes of groundwater during times of flooding. The SCCB wall keyed into a clay layer beneath the cobble and sand layers. 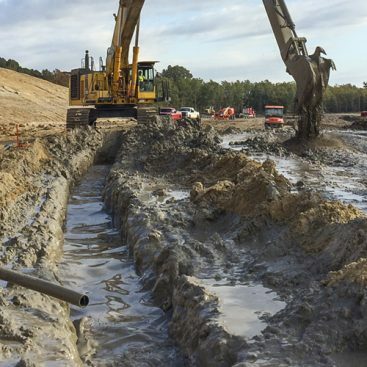 Geo-Solutions was contracted to install the Slag-Cement, Cement-Bentonite slurry wall, to serve as the subsurface groundwater barrier and base for the H-Pile wall that will be constructed as part of the larger Bloomsburg Flood Protection Project. 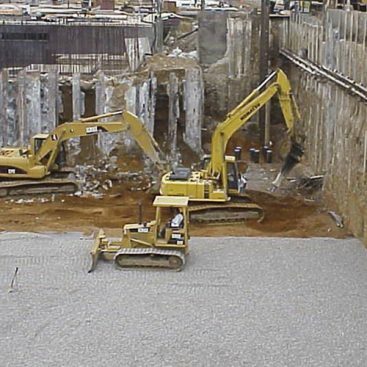 The CB wall was installed with a Komatsu PC400 utilizing Geo-Solutions’ custom long stick and bucket excavating under an engineered fluid. The excavation was completed by connecting 20-foot long cuts that were each individually dug to key depth ranging from 25 to 30 feet below the constructed work platform. 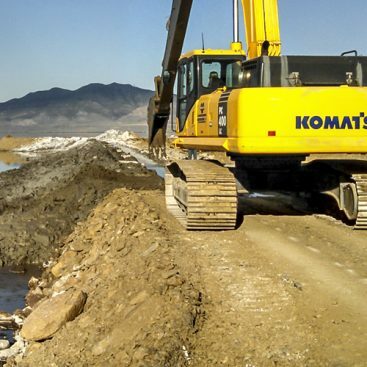 The SCCB slurry was manufactured on site in Geo-Solutions’ continuous mixing batch plant and delivered to the current location of excavation along SCCB wall centerline alignment via moyno pump through 6-inch HDPE pipe. The SCCB slurry consisted of a proprietary blend of Blast Furnace Slag, Portland Cement and Bentonite Clay. The target permeability was 1×10-6 cm/sec at 56-day cure and the target unconfined compressive strength (UCS) was 25 psi at 28-day cure. Both targets were met within the curing timeframe set forth in the technical specifications. 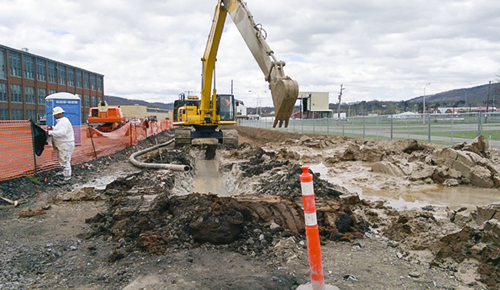 Due to the SCCB wall centerline alignment running adjacent to the Bloomsburg Fairgrounds, several areas along the alignment consisted of a tight work platform. Particularly the areas along the Ticket Booth (Closure 2) and the Rest Room building (Closure 3) caused Geo-Solutions to position the excavator in locations where the swing radius of both the arm and counterweight were close to contact with the structures. The alignment also consisted of 17 turns ranging from 45 to 90 degrees. 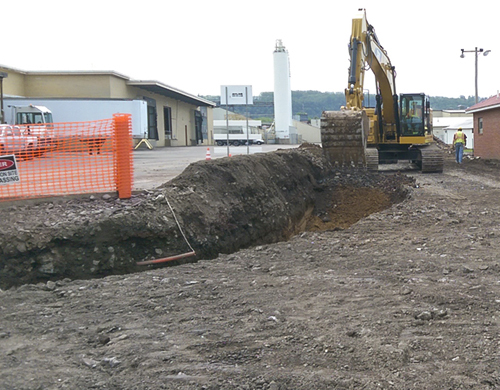 Geo-Solutions also excavated around an active fiber optic line and high pressure gas main.